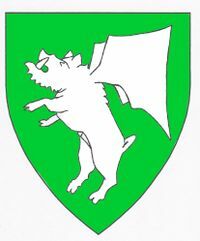 Vert, a bat winged boar salient argent. Master Harold was born in 1443 and spent his youth in the family castle above the town of Bensheim,Germany just east of the Rhine. When he was of age, his father, knowing the value of a good education, sent him south to study at the university in Bologna, where he developed the skills of a scribe. While traveling with a friend to Florence, he fell in love with the art and culture that existed in the city, and will often appear today wearing the fashions of that city. In a.s. VI, Baroness Asdis Stefandottir of Barony of Jararvellir, now in Northshield, took him into her household proclaimed Harold to be her personal troubadour. He continued to travel, plying his trade as a scribe and musician until a.s. XVII when he settled in the Shire of Vatnaskvadsadir in the East, where he served in the offices of A&S minister, herald, then seneschal. 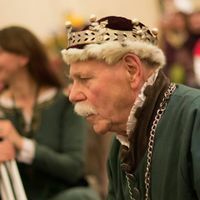 In a.s. XXVI, Harold joined Baroness Megan Laine to become second Baron Stonemarche, and became known as the “archer baron” because Stonemarche fielded so many archers. Now retired, Harold continues to cultivate scribal arts and archery, and occasionally offers heraldic advice. This page was last edited on 26 February 2019, at 22:14.